"The installation challenge was placing speakers where they were both aesthetically pleasing and would perform to the specifications. We chose (these) McCauley loudspeakers because they use high performance components and the cabinets are top-notch quality." "It’s midnight in downtown New York City, and a line is forming at the corner of Broadway and Bleecker Street. At first glance, you think it’s the queue for the bus, but then notice the over-abundance of designer duds: Something else is afoot. These folks are awaiting their entrance to Table 50, NoHo’s latest and greatest subterranean nightclub. Table 50 is named after gossip reporter Walter Winchell’s spot in the exclusive Cub Room at the Stork Club, where he would tape unwitting (and drunk) celebrities for his infamous column. Like its namesake, the 3,000-square-foot lounge is both brash, with a dancefloor and coveted cabaret license (which legally allows dancing in New York City), and understated, with candlelit corners and quiet lounging. But besides its name, what sets Table 50 apart from the rest of the New York scene is the design work that went into its soundproofing, acoustics, and sound system. Going above and beyond the usual level of audio interest for “basement clubs,” Table 50 enlisted industry heavyweights Sam Berkow, structural acoustician and founder of SIA Software and SIA Acoustics; Brad Berlin, founder and principal designer of Berlin Acoustics; and installer Paul Bell of PBell Sound to make the club’s audio as courteous as it is bold. above that is four floors of pricey apartments. “We were determined not to allow sound from Table 50 to transmit throughout the building,” said Tom Lake, technical director for the club, who oversaw the installation. And with only 10 weeks from breaking ground to opening day, the silence had to happen fast. In order to combat the potential noise problem, Berkow’s SIA Acoustics team brought in a demo sound system to mimic the eventual permanent installation, and measured the sound transmission from street level to the building’s top floor. They determined 115 decibels (dB) as a suitable baseline for music inside Table 50: At that volume, it was respectably loud and authoritative, but not so deafening that it would disturb patrons or neighbors. “We discovered that [115 dB] was a proper level for people to enjoy the music, but still be able to talk to one another,” explained Lake. Then the team employed several soundproofing techniques. They opted for floor-standing McCauley loudspeaker stacks for the club’s main systems, and wall-mounted the fill speakers to avoid transmission of sound into the building structure. But that wasn’t enough. Table 50 has low ceilings and wood walls, which can make for short echo times if left untreated. But since the walls were an exotic wood veneer and couldn’t be messed with, the best place for sound absorption was the ceiling. So Berlin and Berkow designed an isolated ceiling using Kinetics Noise Control deck-suspended ceiling hangers. Using a combination of springs and rubber or fiberglass pads, the suspended ceiling provides an adequate cushion between the building and the noise within the club – especially the low frequencies. Folks enjoying a meal upstairs at Corner Shop, for example, do not feel the thump of the sound system below. Additionally, the hangers create 10 inches of air space between the structural ceiling and the suspended ceiling, which is filled with fiberglass insulation for added noise control. To acoustically improve the listening environment inside Table 50, the team added AirSpace acoustical panels, designed by Berlin and manufactured by Berlin Acoustics. Mounted to the underside of the ceiling with aluminum standoffs, the panels have a two-inch thick, six-pound density fiberglass core that absorbs broadband sound energy. They act as another layer of sound absorption and soften the listening environment, allowing patrons to enjoy the music and speak to one another without too much ear fatigue. For additional absorption in the club’s alcove spaces, the team ordered decorative wall-mounted “photo murals” printed on acoustically transparent fabric and stretched over a semi-rigid fiberglass core. Plus, they offset one wall at the far end of the club at a three-degree angle to reduce flutter echo - another way to make Table 50 a better listening environment. In order to accomplish Table 50’s stated goal to attract top-notch DJs from around the world, the club had to look and sound the part. To get the jocks, they hired Joanne Colan, formerly of MTV Europe, to curate the club’s music. She brought with her a roster of established and up-and-coming talent. But the rest was up to the tech team. Table 50’s interior design was a collaborative effort between the owners, various contractors, and consultant Robert McKinley, who helped guide their ideas into feasible designs. Patrons enter down an ancient, dimly lit cast-iron stairwell off the street. Inside, exposed 100-year-old brick and fieldstone walls give way to American teak-veneered panels. Custom designed mohair and leather banquettes with distressed leather ottomans and individually welded cast-iron cocktail tables sit atop the reclaimed chestnut floors. 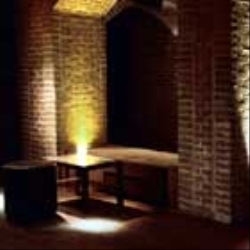 The club is rectangular, with an original brick subway vault along one side, repurposed as multi-tiered seating. 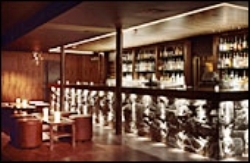 In total, the space generously accommodates 270 people, with a small dancefloor and various seating options. Intertwined with the furniture and finishes is another rather large line item in the club’s budget – a quality sound system. To create a system that would attract and retain Colan’s world class DJs, Table 50 turned to Berlin for the interior acoustic and sound system design. To help achieve this effect, Berlin utilized a dbx speaker management system to control McCauley AC122-2 mid/high loudspeakers, which are stacked on top of McCauley EA688 subwoofers. Each floor-standing stack is placed on either side of the DJ booth, facing the dancefloor. “These concert-quality speakers are pointed the long way down the room to minimize destructive reflections from the side walls,” he says. The system is powered by QSC amplifiers, and optimized and aligned using SIA Smaart software. According to installer Paul Bell, “the installation challenge was placing speakers where they were both aesthetically pleasing and would perform to the specifications. We chose McCauley loudspeakers because they use high performance components and the cabinets are top-notch quality.” Bell’s PBell Sound provides sound systems and technical services for hospitality venues throughout New York. With visits from celebrity audiophiles including Prince, Busta Rhymes, Maxwell, and Damon Dash, and no noise complaints to report, Table 50’s investment in a quality sound space was well worth it. And if all else fails, club managers can take advantage of that old standby, the volume control knob, to keep a handle on things."